The metaphorical tale starts as an innocent and joyful ride. The ‘Round’ in the ‘Merry’ turns out to be an entire lifetime beginning at infancy and carelessness, through adolesence and love, to old age and loneliness, and back. Although in the end the merry-go-round has only travelled a short distance, it manages to dock at some of the major cornerstone emotions of most human lives in a seamless transition of colors which build intensity better than any dialogue could. The pang of sudden loss is felt as the little girl realizes she cannot run back to her mother. As she grows older, we are vivdly reminded of carnival that life can be. We see her get lost in a beautiful dance of love and then crash into a dark loneliness. Right at the darkest darkness, the merry-go-round is whisked off into the sky and we find ourselves at the last stop, the joy of being reunited, and it feeling soooo goood. 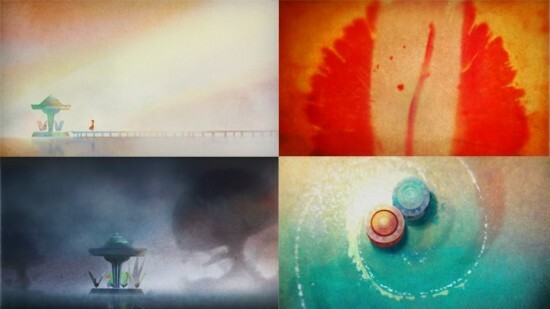 Who knew that such a simple little wash of colors in motion could hide such profound and well constructed metaphors? What a great idea. Thanks for sharing those knowledge. I will absolutely check it out. When peter picked a pickled pepper? What did he do next? “>cheap tee shirts at Bing. I wanted to say thank you for taking time to share this site and letting me post. Hi, I have a passion for exploring the net !. Astounding isn’t it that 15 years ago it hardly existed. These days even Bill Clintons cat has a blog !. Sorry in case you feel I am being cheeky submitting this here BUT I’m 15 years old and have to do a project at school (for my GCSE exams). It would really, really help if folks posted on here how many hours a week they believe they spend on the Web. I think I’m up to 30 hours !. Really appreciate anybody taking the time to reply. Thanks. Bookmarked, I will return every single week. Thought I would remark and say cool theme, did you produce it on your personal? It is really really beneficial!